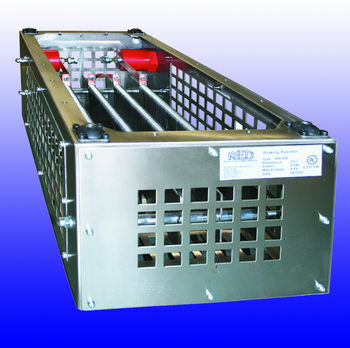 REO has added a high voltage unit to its range of braking resistors. It is ideal for dynamic braking applications involving large frequency converters or as a charging resistor for rail applications. The NTT606 units are compact, just 345 x 640 mm by 250 tall, and easy to install with excellent corrosion protection. They also have good vibration and shock resistance making them especially suitable for use in traction or shipboard applications. There are four models in REO’s NTT606 high voltage braking resistor range which covers from 600 to 2700W continuous power ratings, all with up to x20 maximum rating overload capability. Resistance values are from 1.20 to 52Ω and all models have been tested to 9.5kV.